Preheat oven to 400°F. Trim top off garlic; discard. Moisten head of garlic with water; wrap in foil. Bake 45 minutes or until garlic is softened; cool completely. Squeeze garlic into food processor or blender; discard skins. Add beans, oregano, black pepper, and ground red pepper; process until smooth. Stir in spinach. 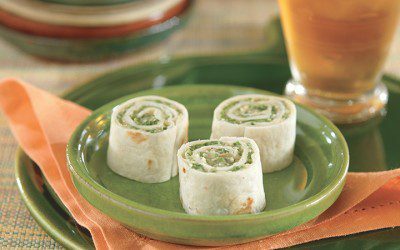 Spread mixture evenly onto tortillas; roll up jelly-roll style. Cover and refrigerate 1 to 2 hours. To serve, trim 1/2 inch off ends of rolls; discard. Cut rolls into 1-inch pieces. Exchanges per serving: 1 1/2 Bread/Starch, 1 Vegetable.